The Bible is a rich source of poetic philosophy and elegant exaltations. It’s also packed with weird contradictions and bugshit cray-cray. 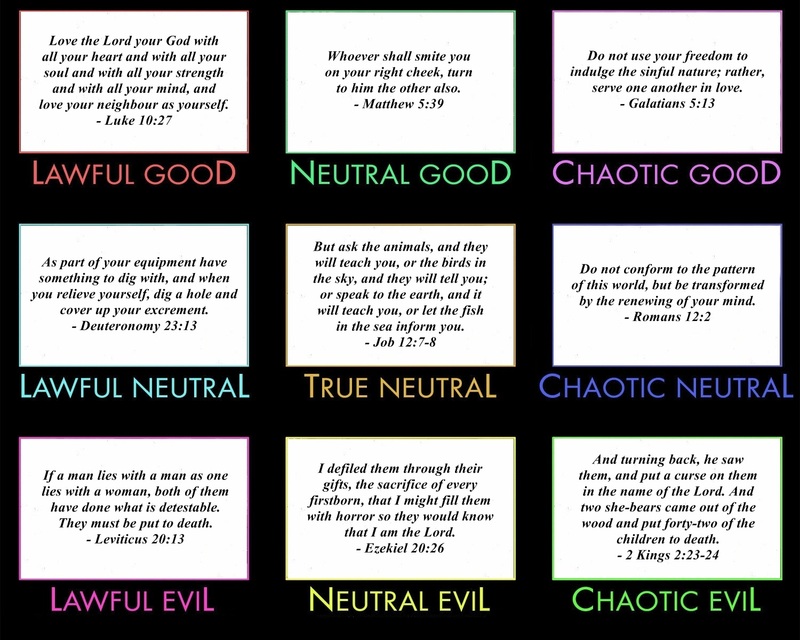 You could probably populate a hundred alignment charts with Bible quotes. I settled for just this one. Ladies and gentlemen; The Bible. Some people think that every word of it is literally true! My friend Christopher Bird has a thing for alignment charts. If you don’t know what that means, these people will explain it to you. This week Christopher made the Mad Men alignment chart, followed by the DS9 alignment chart, and since he’s declared Alignment Chart Week at his his blog, I suspect there’s more to follow. It seems like the sort of nerdy thing I like to do, so I thought I’d have a go at it - hey, it’s Alignment Chart Week! - and because I thought it was a fairly safe bet that Christopher wasn’t going to do one for Glee, I decided to step in to the breach. The world needs a Glee alignment chart, right? It was either this or classic Warner Brothers musicals. Maybe I’ll do that one next. I know someone will surely call me a misogynist for putting women in all three ‘evil’ slots, when I could have put Sandy Ryerson or Dave Karofsky or Brian Ryan in there. My response to that is, shut up; evil women are awesome.